We’re not totally sure how Christian Peterson got all these bikes on his building’s façade, but he’s certainly given new meaning to the notion of a green wall. 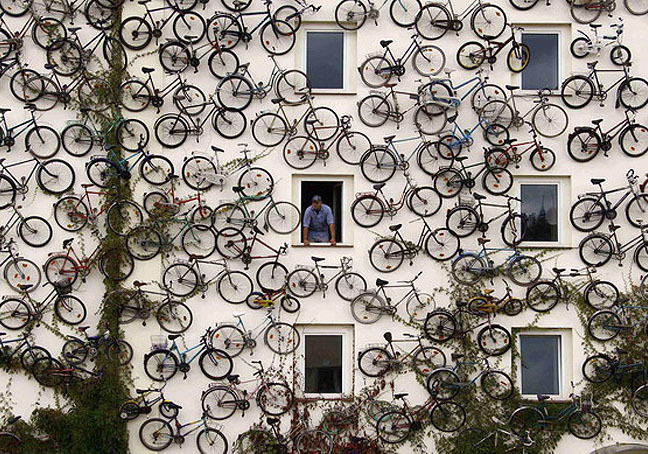 The co-owner of a bicycle shop in Altlandsberg, Germany, Peterson decided to forgo the traditional storefront sign — instead he mounted his entire inventory of 120 bikes for passers-by to see. An ingenious way to advertise his shop, save some space, and promote green transportation, this too cool idea is definitely more impressive than anything an overpaid ad exec could come up with! This is great advertising but dont you think he would be worried about people taking the bikes?! We’re not totally sure how Christian Peterson got all these bikes on his building’s façade, but he’s certainly given new meaning to the notion of a green wall. The co-owner of a bicycle shop in Altlandsberg, Germany, Peterson decided to forgo the traditional storefront sign -- instead he mounted his entire inventory of 120 bikes for passers-by to see. An ingenious way to advertise his shop, save some space, and promote green transportation, this too cool idea is definitely more impressive than anything an overpaid ad exec could come up with!